DOWAGIAC, MI--(Marketwired - Jul 8, 2016) - The Pokagon Band of Potawatomi Indians is pleased to announce that it has completed the first phase of its Tribal Village in Hartford, Michigan. 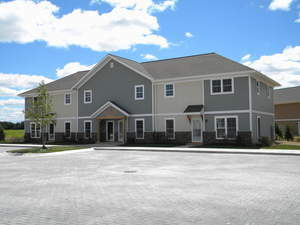 Located on Red Arrow Highway, approximately one mile east of Four Winds Hartford®, Pokégnek Édawat Hartford includes eight homes consisting of townhomes and two duplexes. Additional phases are planned, which could include more homes and a community center. "The opening of Pokégnek Édawat Hartford is an important milestone in our efforts to provide affordable housing and a better quality of life to our Citizens," said John P. Warren, Chairman of the Pokagon Band of Potawatomi Indians. "We are proud to welcome the first residents and look forward to welcoming more families as we complete the next phases of development." Half of the homes in the first phase of Pokégnek Édawat Hartford are designated for Tribal Elders and Citizens with other abilities. Some homes feature handicap accessible designs that include roll-in showers, lowered counters, sinks, and cook tops, under-the-counter microwaves, four-foot-wide doorways, more electrical outlets in the master suite for charging medical equipment, and larger garages for special vehicles. A playground will also be added later this year. The homes in Pokégnek Édawat Hartford are managed by the Pokagon Housing and Community Development Department. It offers Pokagon Citizens assistance with home ownership, loans, lease-to-own opportunities, and rental and homeless prevention programs. The Pokagon Band also has 66 homes, a community center, and an activity complex in Pokégnek Édawat Dowagiac. Both Tribal Villages are examples of what a potential Pokagon development in South Bend, Ind. could look like. The Pokagon Band of Potawatomi Indians' sovereignty was reaffirmed under legislation signed into law by President Clinton in September of 1994. The Pokagon Band is dedicated to providing community development initiatives such as housing, education, family services, medical care and cultural preservation for its approximately 5,000 Citizens. The Pokagon Band's ten county service area includes four counties in Southwestern Michigan and six in Northern Indiana. Its main administrative offices are located in Dowagiac, Mich., with a satellite office in South Bend, Ind. In 2007, it opened Four Winds Casino Resort® in New Buffalo, Mich., followed by Four Winds Hartford® in 2011 and Four Winds Dowagiac® in 2013. More information is available at www.pokagonband-nsn.gov. The Pokagon Band of Potawatomi Indians has completed the first phase of its Tribal Village in Hartford, Michigan. Located on Red Arrow Highway, Pokégnek Édawat Hartford includes eight homes consisting of townhomes and two duplexes.